Farmhouse frames are all the rage right now, and I absolutely love the look of them. 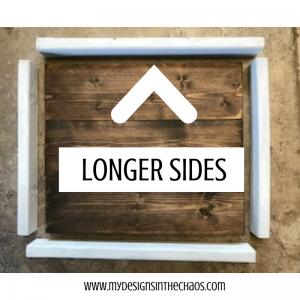 They are super easy to make and I love that the possibilities of these DIY farmhouse frames (color, size, or design) are truly endless. 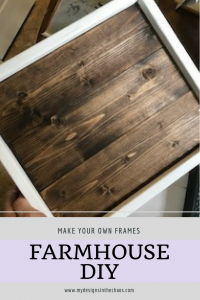 In this DIY farmhouse frame tutorial, I’m going to show you exactly step by step how to create your own farmhouse frame. 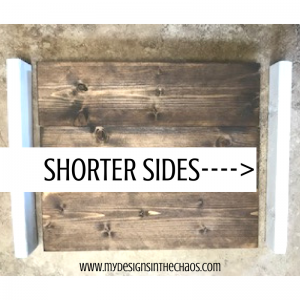 For the DIY farmhouse frame tutorial you can get the common board whatever width you would like. If you get the skinnier width you will have to glue the pieces together to create the size background you want. If you get the wider one (1x12x6) you can just cut it to the square size you need. 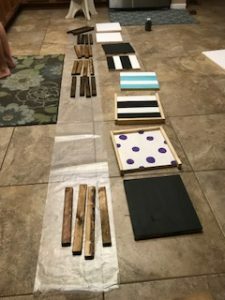 Head over to your favorite hardware store and grab a plank (or several depending on how many frames you will be making) of common board and a plank of furring strips. 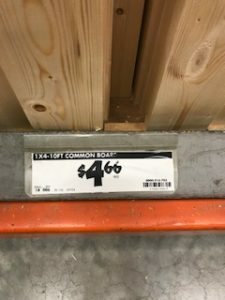 You can get whatever width that you would like of the common board and have them cut it down to size for you. 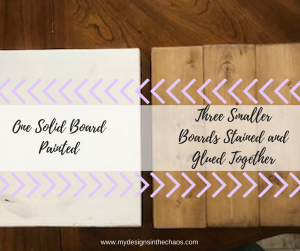 (some places charge and some will do it free) I made a combination of skinny boards that I glued together and wider ones that were already the size I wanted. I wait to cut the furring strips till my common board is sanded and ready to go. Step 2: Once you have the background boards all at the sizes that you want (depending on how big of a frame you are making) sand sand sand. Sanding is a crucial step because without good sanding your vinyl or stencil will not stick to the wood. Step 3: Now comes some of the fun creative part. You get to make the choice of what the background of your frames are going to look like. 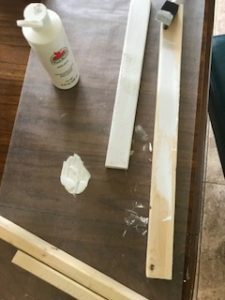 You can either paint or stain the background of the frame. Here is a look at the two different styles. Step 4: Once the back grounds are stained or painted you will now cut the furring strips to fit the size of the board. This is where that circular saw come in handy. 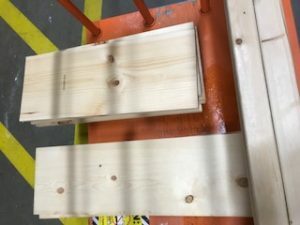 (also if you are gluing smaller boards together you will do that first before you measure out the furring strips…. make sure to let the glue dry before you move on to assembling it in the next step) The two sides will be cut first and they will measure the exact length of the board. The tops and bottoms will be cut second and they will need to be the length of the board PLUS both of the furring strips in order to create a nice framed farmhouse edge. Step 5: Back to the fun creative stuff! You can now decide to either paint or stain the furring strips that will outline the backgrounds for your frames. If you are doing a ton at a time make sure to keep each of the sets paired up so that everything fits exactly to size. Step 6: Now to attach the furring strips to the common board. This is easiest when you use a brad nailer but can also be done with a hammer and nails. Attach the two shorter sides first and the two longer sides second. 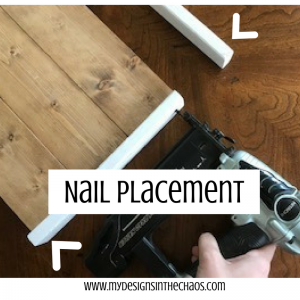 You will place 3 nails on each side. (one on each end and one in the middle) Make sure on the longer sides the two end nails are going into each of the connecting furring strips. Step 7: Add a hanger to the back side and a vinyl design, picture, clip, or anything else you can imagine to the front! 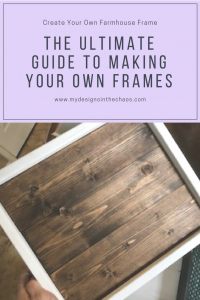 Take a step back and admire the awesome job you did creating your own farmhouse frame! So, no excuse now on why you haven’t joined the farmhouse revolution! 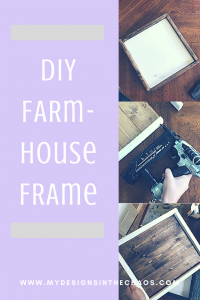 Get out those power tools and using this tutorial create your own farmhouse frame! Have you made your own frames? We would love to see them! Show them off in the comments or over in our FB group and make sure to pin the graphics or share with a friend for easy reference in the future! Did you enjoy this farmhouse frame tutorial? Thanks and Happy Crafting and Chaos!! This post does contain affiliate links to products that we use and love. We earn a small portion of the sale when you purchase things through those links. Sign up here to have FREE cutting files sent to your inbox weekly. 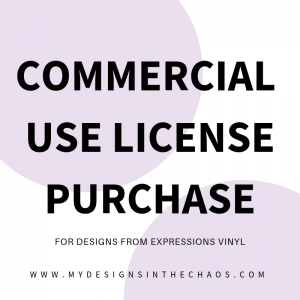 Here at My Designs in the Chaos we strive to encourage, develop, and grow, talent and confidence, through our tutorials, project inspiration, and easy to use SVG files.